Hmmm, I never really knew how I felt about these. On the one hand it’s basically a zero calorie – full of nutrients – spaghetti option.On the other hand, let’s be honest, it’s not spaghetti! But you know what? I’m no quitter! So I try and try again and I’m so glad I did! 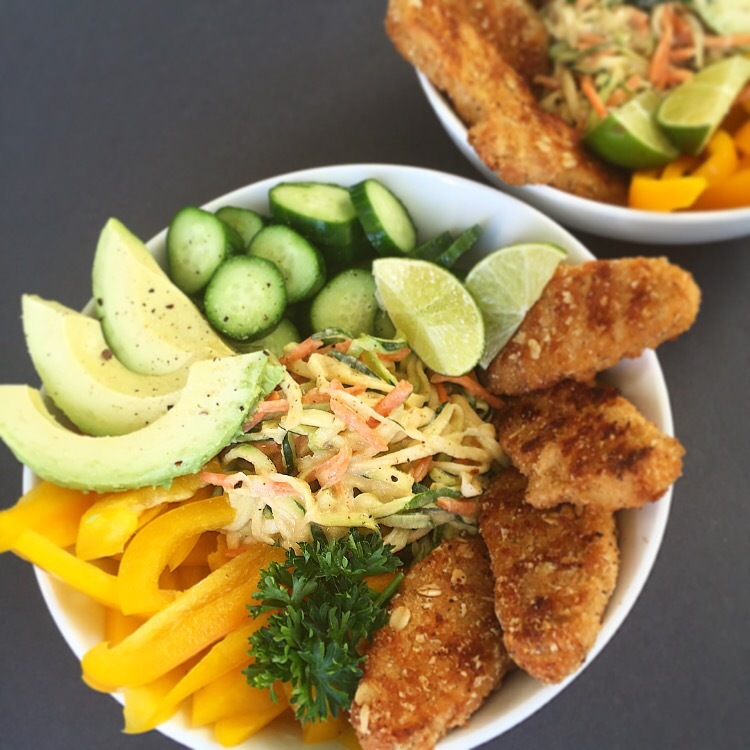 This was a quick & easy dinner that made me feel great and filled me up. This is definitely one of those recipes where I encourage you to modify it anyway you want. You could add tomatoes or broccoli. You could sub the Crispy Chickn for tofu or roasted chickpeas. You could even throw in some buffalo sauce & tahini instead of spicy hummus. Play in the kitchen as much as possible. Just try to make it beautiful because beautiful food is always more appetizing which will make you feel better when eating it. p.s. I bought every single ingredient for this recipe from Trader Joe’s. Their Chrispy Chickn Strips, Sriracha Hummus & Tahini are my always and forever kitchen staples and should be yours too! p.p.s. If you don’t have a Trader Joe’s near you, first of all my condolences, and second you can modify anyway you want. The sriracha hummus is basically plain hummus mixed with a little sriracha added to your spiciness desires. 1. Preheat oven to 425 and line a baking sheet with parchment paper. Place the Chickn strips on baking sheet & bake for 15 minutes removing once to flip over half way through. 2. Make your Zoodles using a Spiralizer or using a potato peeler. Place in a bowl. Top with hummus & tahini and mix really well. Set aside. 3. Slice bell peppers, cucumbers, & avocado. 4. When your Chickn Strips are ready and out of the oven begin arranging your bowls. 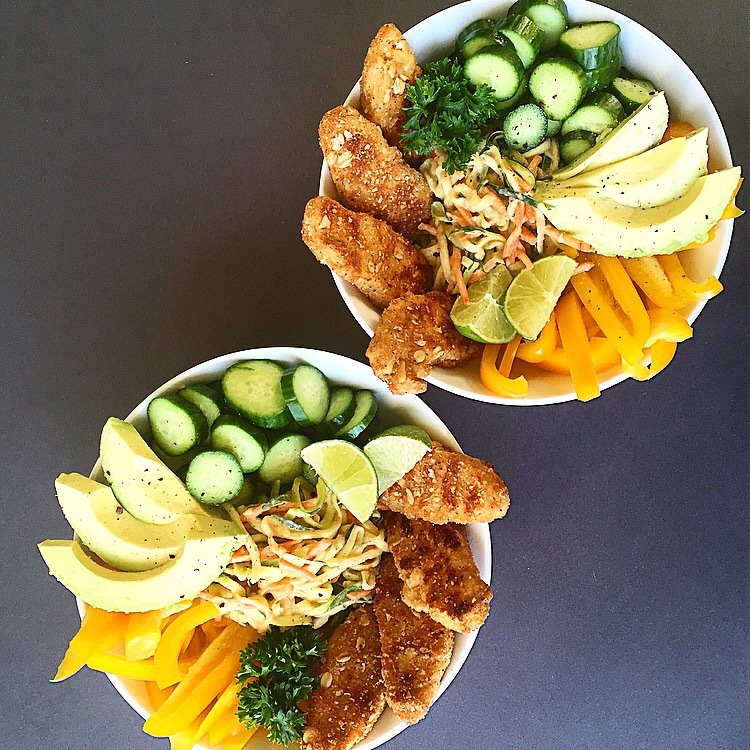 I like to pile the Zoodles in the middle and line up the veggies and Chickn strips around them. 5. Grab your fork and enjoy every guilt-free bite!